I had a bit of time in the craft room- finally! I decided to check the Catch the Bug iapiration for the day, and used the SCS technique challenge- watercolor impression to create! I did not follow the tutorial on SCS exactly.... I used regular cardstock instead of watercolor paper. I applied Distress ink and then spritzed a stencil, placed it wet side down onto the cardstock. It makes a pattern in the ink as it lifts some of the color. I had to use this fun peeking reindeer from Bugaboo- I just love the last release- so many darling images!!! The to/From stamp is from Inkadinkado. I had so much fun today- I bought a Scan and Cut and it has been cutting out all of my images today- I absolutely LOVE it!!! Shelly, this is incredible. Love the technique. Went through Chicago Monday am at 3 so I would avoid traffic so I drove 18 hours straight through to make it home at 5am. I haven't updated my i-pass so it's a real pain through the tolls. Then I had a friend tell me that you can do it on-line, argh...if I would have known. Still avoided a lot of heavy traffic. Thought of you and that I had my Copics with me and we could have been having a playdate, hehe. 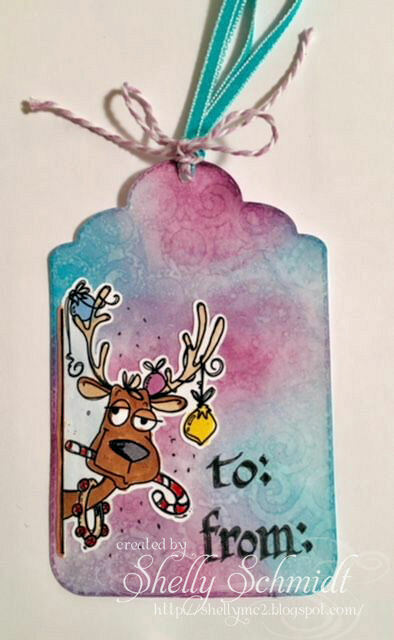 What a fun and fabulous tag Shelly - love your colours!! Two beautiful projects. I love that striped DP. 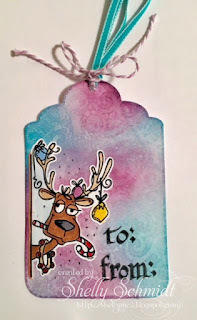 Such a fun holiday tag!! I love it! !